Patio doors are available in a wide variety of styles and materials, with the most common being steel or vinyl frame glass doors that slide open on a track. Typically patio doors have two doors that allow one to slide past the other, which may be fixed or movable as well. 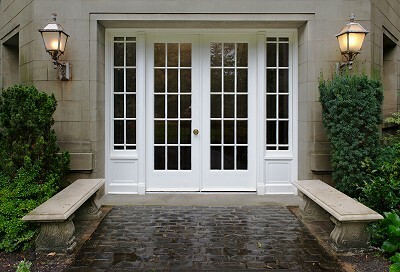 Another popular variation is to use French Doors instead of glass doors for each panel. Less common options for patio doors are the disappearing doors and the hinged doors. Disappearing doors are also called pocket doors, where the doors slide into recesses in the wall for the completely open air look. Hinged patio door sections are hinged in the center with a fixed pivot point at the wall and the other end of the door slides in a channel, folding the door section in half.